I’ve had a lot of visitors this summer and maybe you have too. The challenge for me, and I think many of us that are stationed here, is we end up going back to the same places over and over. I decided to shake it up a little bit and add a few day trips that my visitors would love and I could investigate and share with you. 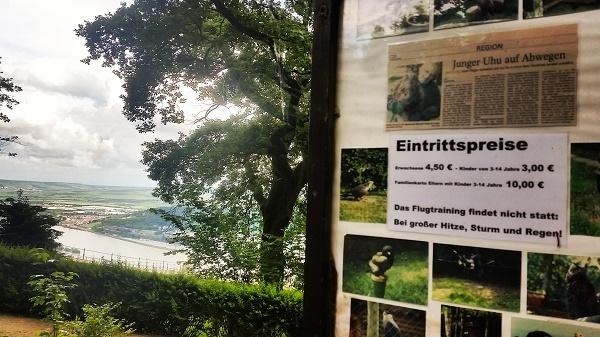 Here is a blog on visiting three countries-in-a-day for people in the Stuttgart area. It may sounds exhausting, but I promise it is worth it and unforgettable for everyone who goes along. When traveling through other countries surrounding Germany, you have to do a little preparation. We visited Switzerland, Austria and Germany. In Switzerland and Austria you will need vignettes. Vignettes are toll fees/permits you must affix to your front windshield to legally travel through these countries. The yearly vignette for Switzerland is €38.50 and a 4-day Austrian vignette is about €8. Vignettes for both countries can be purchased at an ADAC office or at gas stations right before you cross the borders. I don’t like leaving this to chance. Because if you miss it, it’s a very hefty fine. A fine for Switzerland can be about €160 or 200 Swiss Francs plus the cost of the vignette. My cousin and her husband came to visit this summer with their eight-year old daughter, so I knew castles and fun parks were going to be on the agenda. However, I didn’t know she would love some of my favorites too, like chocolate, cheese and outdoor parks. So planning this trip was a lot of fun collecting and gathering research. Thanks to my friend Heather ,who already did a similar trip and shared her information. 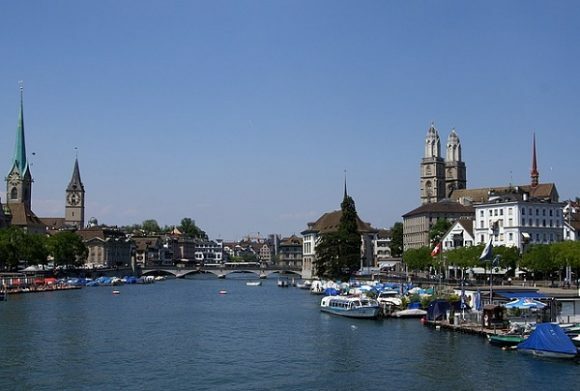 The trip to Zürich is beautiful from Stuttgart. On your way through the Black Forest, you will see the wonderful landscape that is just breathtaking. We did not pass any Esso’s the closer we got to the border so you’ll want to fill up before you go into Switzerland or Austria. Gas is “uber” expensive. 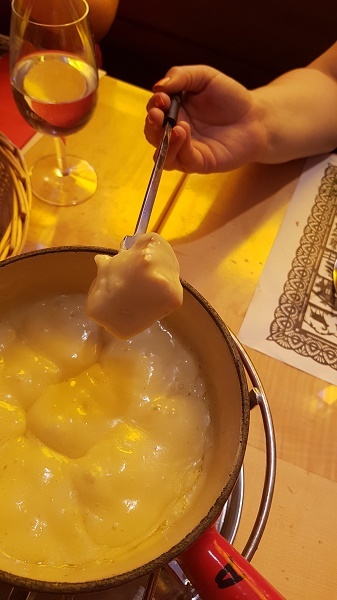 Of course, Swiss cheese fondue was on the menu and we chose the Hotel Adler on Rosengasse Strasse in Zürich. 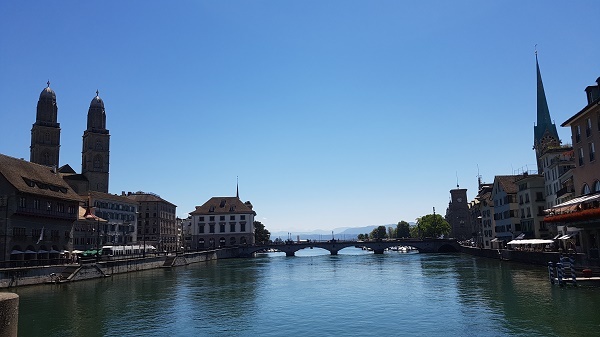 Because we parked at the Urani Park House, we were able to walk across the beautiful bridges along the promenade to the old city of Zürich. Making reservations were very easy online and we arrived with time to spare. The Hotel Adler was wonderful beginning with our delicious four-cheese fondue to our excellent waiter, Vladimir. After very full bellies, my little cousin really wanted some Swiss chocolate. On the recommendation of our new friend Vladimir, we discovered Sprüngli. 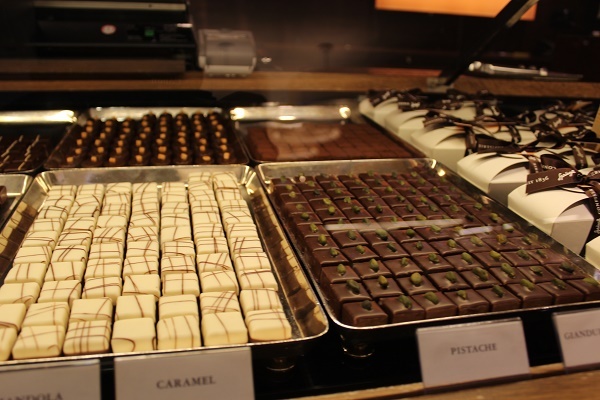 At this amazing chocolate store/restaurant/eatery, we were able to sample each chocolate delicacies. Normally, I am quite hesitant visiting Switzerland because of the price tag. However, we were able to enjoy lunch and have a little chocolate and not spend a fortune. My daughter and I split our fondue and a salad. With a few bottles of water on the very hot day we spent about $70 total. Then at the chocolate shop we all split a 200 gram chocolate box giving us about 3 chocolates each averaging out to about 2 CHF ($3) each. They were definitely worth every bite. 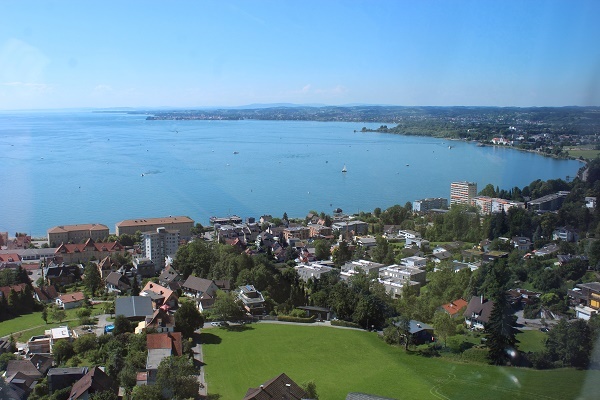 If you live in Stuttgart, you’ve probably heard of the Bodensee or Lake Constanz. This marvelous, immense body of water is shared by the three countries Austria, Switzerland and Germany. 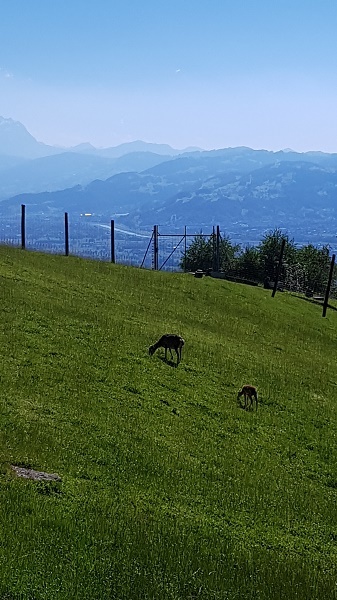 My friend Heather really enjoyed seeing it from a unique perspective the Pfänderbahn (cable car) in Bregenz. With the panoramic cable car on the way back to Germany, it made it perfect stop to see all of the Alps. 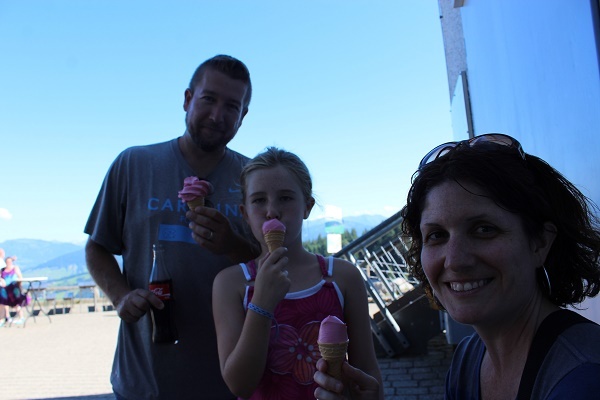 At the top of the mountain (Berg) there is a restaurant open during the summer, a kiosk for ice cream and an interactive Alpine nature park. My young cousin really enjoyed the playground as well. 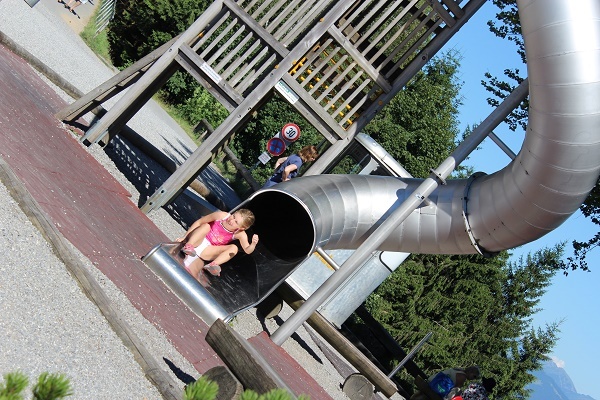 It was about €12.50 for a round-trip ticket, but it also included entrance into the nature park. It looked like there were hiking trails up the mountain if you prefer this to the cable car as well. We didn’t stay too long at the zoo because we still had one more stop in Germany. 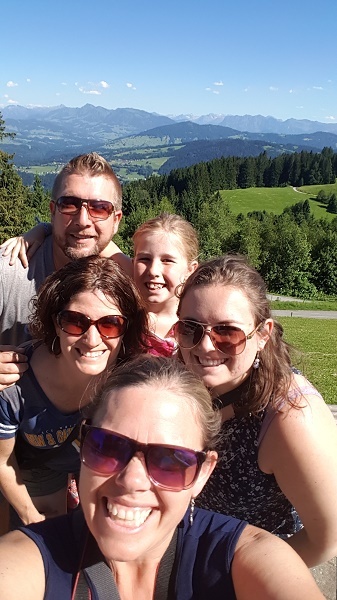 However to find out more about this region, check out my blog on the Bregenzwald in Austria. 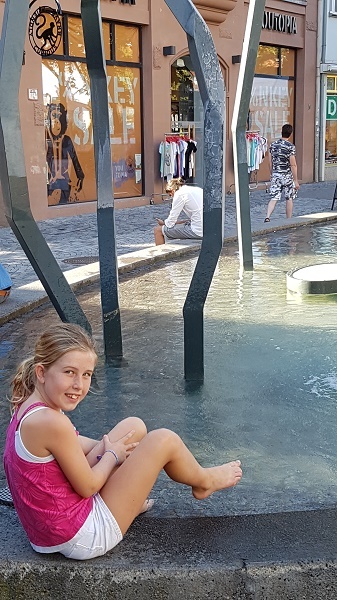 Having visited the beautiful puzzle town of Ravensburg this past year, I knew what to expect and found it easy to walk through and retrace my steps for my family. 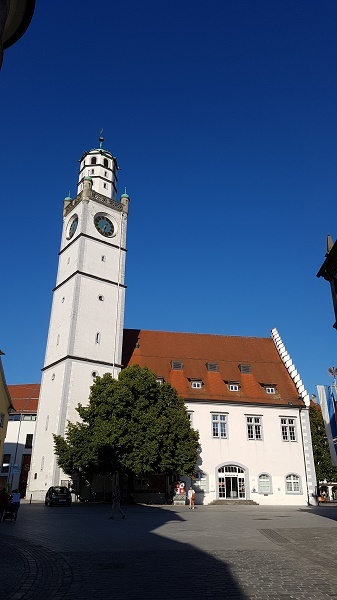 Opened from 10 a.m.-6 p.m., the Ravensburg Puzzle Museum is interactive and fun for children for all ages. The quaint city is lively with lots of architecture, free museums and towers to investigate. To park within walking distance to the old town and the closest to the museums, click here. 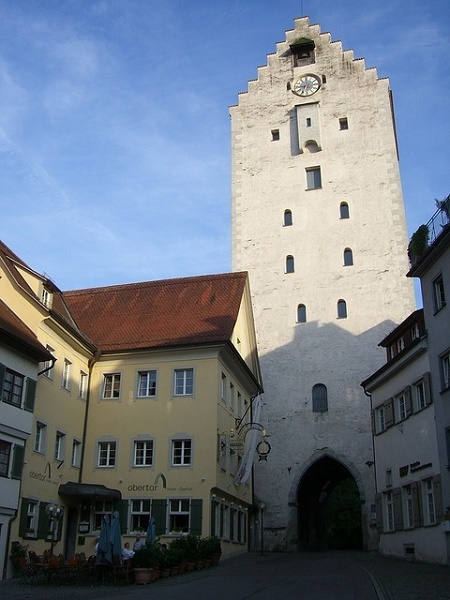 The Blue Tower is one of the most famous sites in Ravensburg. Up until the last twenty years, the tower would ring daily to announce the beginning of the day. And if you would like to climb the tower, you would have to time your arrival accordingly; it is only open a few hours during the day. 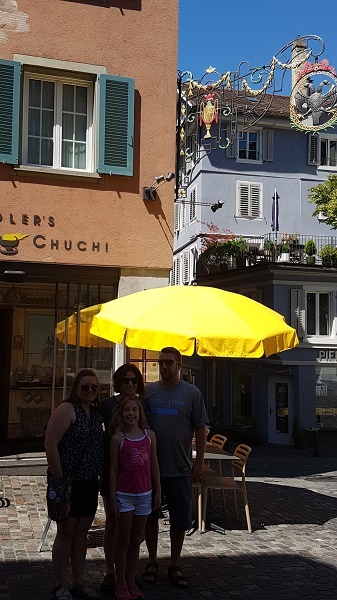 Whether you decide to make Ravensburg your first stop on the 3-countries-in-a-day tour or your last, it is a great place to visit with lots to see. So that was it! Our total driving time was about 5 hours and 45 minutes with only a little bit of traffic coming back in Germany. We went on a Wednesday, so traffic was lighter than it might have been on the weekend.